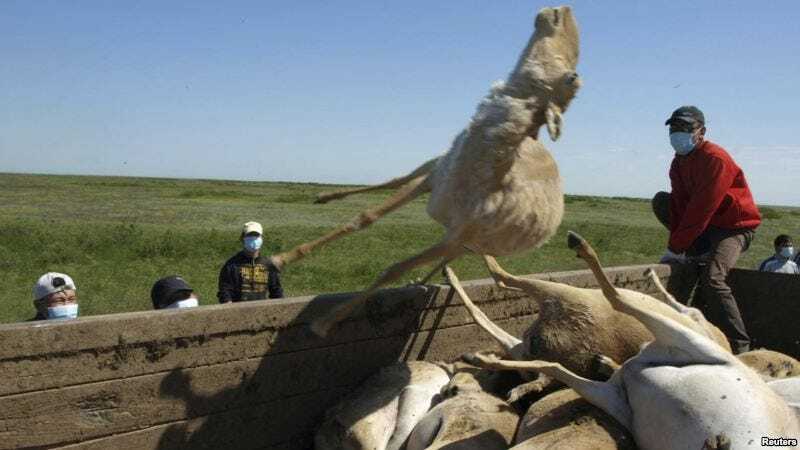 Three years ago, 12,000 rare and endangered antelope carcasses were mysteriously found in Kazakhstan. Nobody knew what happened to them. Exactly one year later, people found 450 new dead bodies. No causes were found. Now, they have found another 1,000 corpses and nobody knows what is killing them yet. But some scientists think they know the answer: a spacecraft killed them all. My personal opinion is that it is connected with human activity [and] that it is due to an anthropogenic factor. It could be from chemical elements left from space rockets that fly over this place, or from other chemical factors, such as the extensive use of fertilizers, which are very harmful. These ones were found near the site of a recent Soyuz landing, which may suggest a potential connection. However, other scientists don't have it so clear yet. Officials at the Qostanai Oblast's Department of Forestry and Hunting are still looking for a cause. They don't rule out the spacecraft chemicals, but it may be something else. What happens is that the females give birth and they are under great nutritional stress because they're producing milk and they've just given birth. So they seek out very rich pastures and that's why the females are particularly suffering. And then the babies tend to die later from starvation. However, they are not ruling out a potential link to chemicals yet.